Malvan is a small town in the district of Sindhudurg district. It also boasts of serene calm beaches with the longest shoreline. Tarkarli beach is a part of Malvan and is the next most hit. The closest beach to Malvan town is the Chivla beach. Apart from offering a perfect beach destination, Malvan is also known for its fiery cuisine. Malvan food is prepared in a unique way with ample of coconut used in Malvani dishes. Malvani cuisines actually are a blend of Maharashtrian and Goan cuisines. Tarkarli is now becoming a hot destination for water sports. The Tsunami Island, which is in the Karli backwaters is fast emerging as the focal point of all the adventure water sports in Tarkarli. 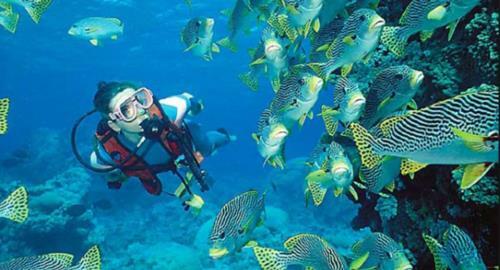 Scuba diving and snorkelling are the most favourite activity of the tourists here. The mystery of underwater life and the corals never fails to enchant the divers here. You can catch glimpses of shoals of fishes like Barracudas, Angelfish, Parrotfish, Rock Cod, Tuna, etc. You will also find Sea Cucumber, Turtles, Lobsters, Cuttlefish, Shrimps, etc. There is plenty of corals near Tarkarli along with clear water is a blessing for the scuba diver. Many scuba diving operators take an underwater photograph so that the tourists can carry back good long lasting reminiscences of their diving trip at Tarkarli beach scuba diving. The latest fad catching up here is Parasailing. You can get a birds-eye view of the backwaters and also have a direct look at the beautiful convergence of the backwaters and the sea. Do not miss on the dolphin watch rides into the sea to view the frisking, friendly dolphins playing gleefully in the sea. For all the speed lovers, try out the crazy speedboat ride racing furiously on the waves. Feel the droplets of water on your face and the salty breeze in your hair, as you try out Jet Skiing. Experience the fun of togetherness with your group on a banana boat ride. Though Tarkarli remains pleasant throughout the year, the Tarkarli water sports season is best after the monsoons. Goa, being blessed with the long shoreline, is a hot target for all the water sports junkies. Monsoon water sports combo in Goa offers activities like kayaking, windsurfing, jet skiing, parasailing, banana ride and water surfing. Beaches like Sinquerim offer scuba diving and snorkelling along with other water sports. Try out windsurfing and Paragliding to maximise your fun in Goa. Sea water Sports have come up booking on seawatersports.com with good water sports combo at Malvan and Goa too. With facilities like ours, you would definitely have a great time and memorable trip to scuba diving in goa.